By the time this post goes up, I'm sure most of our readers will have seen Google's circlified icons in the new Pixel launcher, bound for the new Pixel phones. I've been asked a few times what I think about the new launcher and, for the most part, I don't have a strong opinion. But I do have some thoughts about the circlified icons, some guesses at the rationale, and some thoughts about the downsides of consistency for its own sake. As with any written-from-the-outside post about design, I want to note up front that we aren't privy to any research, data, or other information Google used to make its decisions, so the best we can do is respectfully speculate and ponder. Since we haven't seen the final final version of the Pixel launcher yet, there's still one critical remaining question about the circular icon theme - will the Pixel launcher mask third party icons or apply them to white circles matching some of Google's apps like Gmail, or will the launcher simply accept "roundIcon" assets from apps and leave the rest alone? If the launcher goes the former route, we're doomed. But more on that later. If it takes the latter route, things are fine, but circles still seem like an odd choice. So why is Google making that choice? The most obvious possibility is "consistency." An icon having a unique silhouette on Android isn't really a problem from my perspective. But the platform has gotten complaints for years about icons with unique sizes. This is something Nova Launcher, Action Launcher, and others have tried to fix with "icon normalization," where similar shapes are forced to resize to similar dimensions, but it's not something Google has committed to in its Google Now Launcher. So one alternative to forcibly resizing assets is to make sure all those assets are just the same shape to begin with. But this is tough for a bunch of reasons. First, the canvas size doesn't actually normalize just because the shape does. Some apps will certainly have a reserved 176-pixel (for xxxhdpi) circle with that nice shadow Google uses. Some other apps will no doubt want to steal the show with a full 192-pixel diameter. So if that's the case you're back to normalizing after the fact, albeit for a smaller range of potential shapes. Second, and more important than circle diameters, is that the circle creates artificial limitations on icon design. To be clear, I want to point out that I'm not talking about icon packs or themes when I say "artificial limitation" - when someone makes a themed icon pack and chooses a circle as the base shape, they're deliberately putting a design constraint on the project. But when the platform, without any alterations, expects a circular icon, it is asking every partner and every developer and every designer to rethink how they present their brand to the user in the form of a product icon. But more specifically it's asking everyone to do that and limiting them to a canvas that's had all its corners cut off. It's too obvious to state, but a circle simply has less area to work with than a square whose sides are the same as the circle's diameter. And many of Google's own round icons that we've already seen - Gmail, Duo, Play Books, Play Music (and all the other Play apps), YouTube, YouTube Gaming, Drive, Photos, Camera, Play Store - are a testament to the fact that sometimes your logo just doesn't fit into a circle. 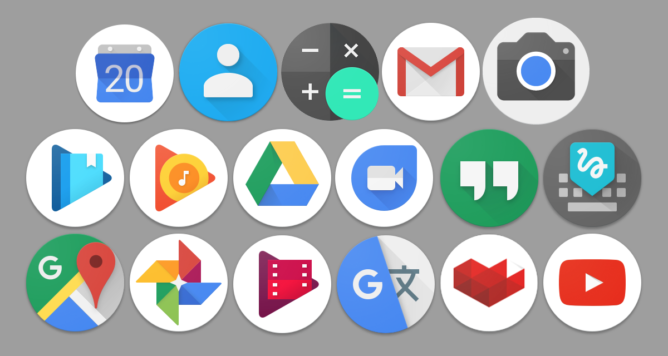 Still others among Google's apps - Contacts, Hangouts, arguably Google Keyboard, Messenger - technically work as circular icons because Google has tailored them to that shape, but lose some of their identity in the process. So really the best one can hope for is that their logo either A) has a malleable enough identity to squeeze into a circle or B) is already a circle and therefore works perfectly from the start. The second best hope is some sort of compromise, which isn't always a great look when it comes to representing your identity. All of this is to underscore that consistency for its own sake is an ultimately destructive force. Few instances come to mind where making something consistent just to be consistent resulted in great design. But what do I mean by "consistency for its own sake?" What I mean is consistency without a sufficiently strong motivation or justification. For example let's say we're working on an app's UI design. Some examples of things we might want to keep consistent include - but are not limited to - the app's color palette, and the style of system components. Let's look at just those two factors. First, the color palette - we might want this to be consistent across the app so that users feel comfortable with their understanding of how things work. Thanks to a consistent color palette a user can, for instance, predict which components in your app will perform an action, which components house navigation options, which components are not interactive, or even which things are not loaded or have errors. This is a strong justification. Next, the style of system components. For this exercise these are things like text inputs and buttons. We might want to keep these consistent because, first, the platform provides them to us in a certain way for free and second, in a broader sense, users of the platform will feel more comfortable and confident with components they already recognize rather than components we've invented and custom styled ourselves. This is a strong justification, even ignoring that custom elements increase technical overhead. But I struggle to come up with a particularly strong justification for circular icons. As the starting point of the device, the launcher is something users learn to use pretty quickly. The appearance of various icons and their corresponding labels are understood to launch apps. So the idea that various shaped icons are confusing isn't very compelling. But how about making the browsing experience more expedient for users? If the icons are all the same shape, maybe it will help users scan through them more quickly. It might, but in practice it probably won't. Going back to Google's own round icons in the Pixel launcher, let's have a look at Play Music, one of the icons we've already seen. It is circular, sure, but only because it has to be. On a plain white circle we have the actual logo for Google Play Music which is itself already a complex triangle-circle-circle-music-note composition. So what we're actually doing by putting icons like this on top of a circle is adding one more (albeit very small) layer of cognition to the experience of just looking at the icon. Extrapolate that to an app drawer full of icons which - if developers even choose to add a roundIcon - will probably look just like this, and I don't think we've sped up any sort of scanning. 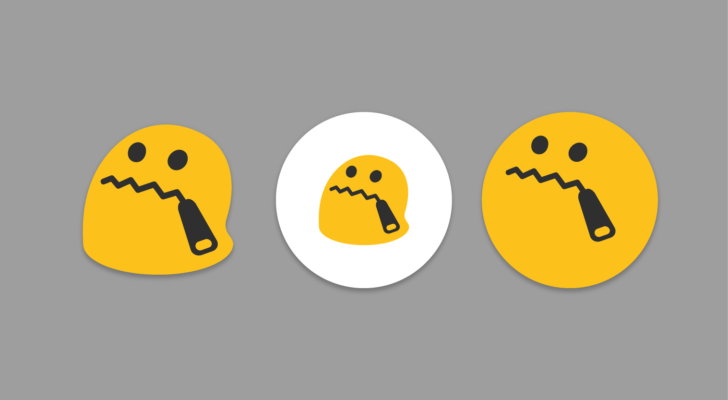 If Google takes the darker route of masking icons - as we see on devices from Huawei and other OEMs - we're even worse off as icons will become less recognizable and less representative of the identity users will see in the Play Store and in other materials from whoever made the app. The only other rationale I'm left with is that circles look good. I won't argue that (it's far too late for me to come out against circles after all the podcast episodes I've been on), but it isn't a sufficient justification if Google expects others to join in the Pixel launcher circle party. All of that having been said, circles are not the end of the world. They may create momentary headaches (or, if your icon gets stuck on a white saucer, permanent ones) for designers and product managers, and they may ever-so-marginally increase visual complexity rather than alleviate it (no matter how Google tackles non-compliant icons), but the effects of circles on users are probably not that great. This is a decision Google appears to have made for its Pixel launcher, but - thanks to Android's own settings - it's one we don't have to live with.